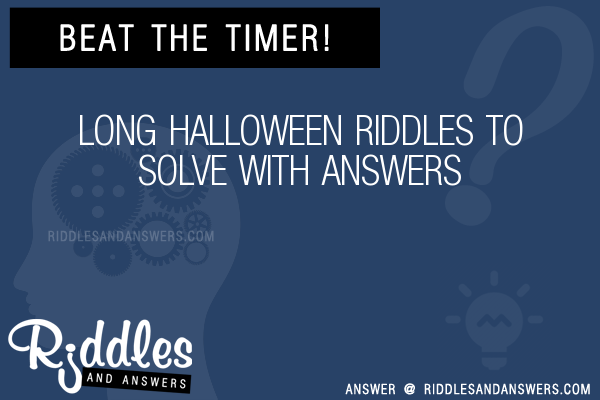 Here we've provide a compiled a list of the best long halloween puzzles and riddles to solve we could find. The results compiled are acquired by taking your search "long halloween" and breaking it down to search through our database for relevant content. What monster plays tricks on Halloween? It is Halloween and your friends dare you to go into a haunted house. You creep up to the door, a little scared wondering what is behind the door. You go in and there is a long hallway leading out into a dark musty room with three doors. You're kind of scared once you are inside. You try to turn back, to get back outside, but when you turn around the door is closed and locked. You yell for help but there is only silence. The room is dark and you look for a light source. You see a light switch and try to turn it on. Sadly the power is out. You are terrified but have no choice but to follow the long hallway to the three doors in the pitch black. Behind one door is a bottomless pit with no end. Behind another door is an electric chair which you must sit in. Behind the last door is a pool full of acid. You must go in one of the rooms to the danger. Which one should you go through? You should definitely go through the electric chair. Since the power is out, when you sit in the electric chair it will have no effect on you. How do vampires get around on Halloween night? What does a wolf say on Halloween? 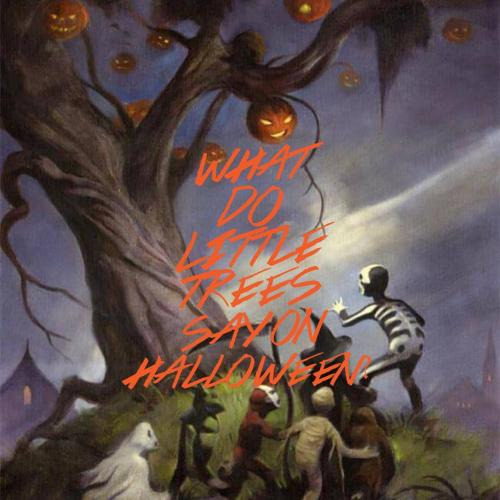 What do little trees say on Halloween? What did the spider say to the fly on Halloween? He web is the trick and you are the Treat! Whats a ninjas favorite Halloween song? Pieces Of You by Jewel! To spice up your Halloween, you decide to enter a haunted house with your girlfriend. As you enter, an eerie silence embraces you and you can see nothing because its dark. You fumble your way and try your luck to find the switches, but it turns out to be a waste as there is no electricity connection to the house. When you decide to turn back, the door closes on you and you are trapped in the house with your girlfriend who has now started panicking. While you are trying to console her, an evil laughter takes you by surprise. Then, you see a faint figure who tells you that you have three doors in front of you and you must take one of them; it is the only way to free yourself. The figure describes that the first door opens up to a compact space filled with a swarm of deadly bees and you will be stung endlessly by them. The second door opens up to the electricity chairs. You both will be strapped to the chairs for five minutes and exposed to high voltage electricity. The third door opens up with a pit that has no bottom and you will keep falling endlessly into nothingness. While this leaves you all panicked, which door will you choose if you have no other choice? You must choose the door that opens with electric chairs. This is because there is no electricity in the house. Thus, you will just have to sit on the chairs for five minutes and then you will be free to go. 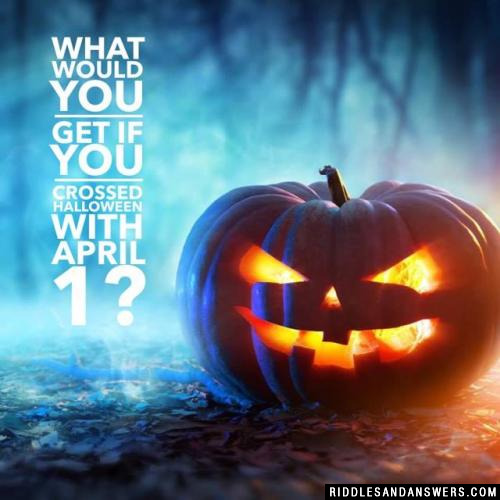 What would you get if you crossed Halloween with April 1? What is a monsters favorite Halloween food?